Never Assume Anything! – a MTT (Mostly True Tale) « Adafruit Industries – Makers, hackers, artists, designers and engineers! Before Gerber files, before Eagle, before DipTrace, Tango, Altium and all this wonderful CAD software, we used Bishop tape and Mylar “vellum” sheets for board layout, and used black & white photographic film to make each layer. Bishop Graphics was a company that provided the two things needed to ‘lay out’ a pc board: precision-cut, specific width paper tape that was stronger adhesive than a Post-It note, but still you could ‘rip out and retry’ if you were careful, and pre-printed DIP and other patterns on Mylar film called ‘Puppets’ (why, I have no idea). You used gridded Mylar sheets (usually about 3ft x 4ft) on a light table, and you used 1 sheet per layer. Most of the time, you used a 4X scale, meaning the tape widths for the traces and the DIP Puppets were 4x larger than the actual board. A huge bellows camera (Tandy’s was about 9 feet long!) then shot 1:1 film that you sent out to the board shop. Tandy was too cheap to actually hire a good pcb layout person in-house, so we used this one consultant who did beautiful work. He was slow, a “good old country boy” with a West Texas drawl and he used an old cigar box as a wallet. 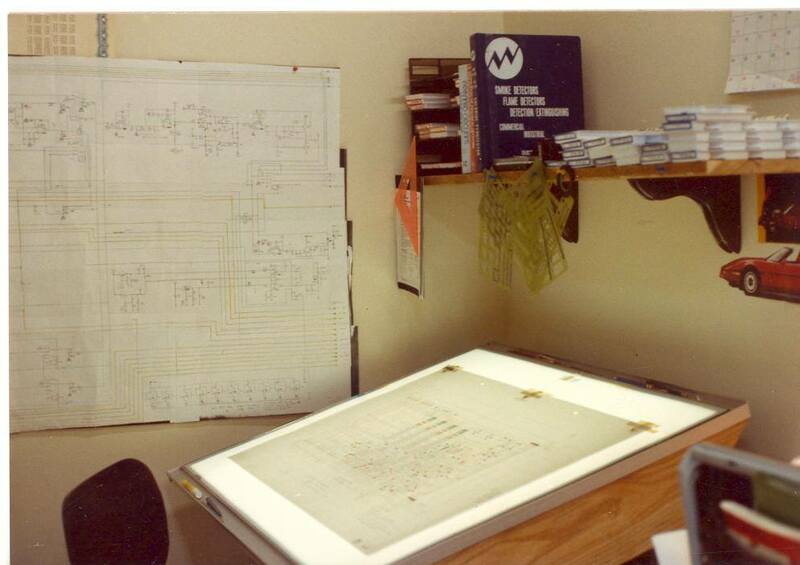 He did every Tandy pcb layout from ~1977 to 1982, when CAD systems started to appear. The rumors were that he was pulling in $100K/yr while all the Tandy EEs were making $20K. a) hand-draw the schematic on ‘D’ size vellum (drafting paper). b) hand draw an “assembly layer” (the MEs did this) showing the location of switches, leds, mounting holes, etc. c) hand it to this guy (I cannot for the life of me remember his name). e) he shows up and hands you 3 large Mylar sheets with the layout taped to it. The Top, the Bottom and the Silkscreen (with the reference designators). He *never* once, in all these years, made a *single error*. He found many of *your* errors, but damn, the guy was good! The 3 sheets were then sent off to the Camera Dept and they were returned with the 1:1 films. We had these huge, expensive, humidity/temp-controlled “blueprint cabinets” that had 1 drawer for each pc board. The drawers had the schematics (originals) and the original, Bishop Tape layouts. Now, it was common for many people to want schematic copies, so we used a “Diazo” machine. These used a special paper that was impregnated with a chemical that was sensitive to ammonia AND light. So what happened, is that you placed your original on top of this paper (‘yellow side up!’ as the paper was a pale yellow on the ‘print side’) and shoved it into the blueprint machine. It looked like a big HP pen plotter: it had 2 sets of rollers. The first set was the UV light exposure. You shove the 2 sheets (on top of each other) into Slot 1. The rollers grabbed the paper stack, and the blueprint paper was exposed to UV light. Where there was pencil/’blackness’ on the original, the UV light was blocked, and the yellow chemical *remained*. Where there was just ‘white space’, the UV light removed the yellow chemical. Next, you removed your original, set it aside, and stuck the blueprint paper into Roller set #2. This exposed the paper to very strong ammonia. The yellow chemical turned a dark, cobalt blue color. TaDa! You had a blueprint. (Ed. note: actually a ‘whiteprint,’ original blueprints were white print on a blue field). The blueprint machine was directly across the open room from my cube, about 65ft away, against a back wall where the tank of ammonia was (OSHA? We don’t need no stinkin’ OSHA!). One day I am staring off into space and I see one of the new guys from the computer division (I was in the non-computer division) making several copies of schematics with the blueprint machine. Well, or trying to. So I walked over, showed him how to use it, set the contrast up (which was the roller advancing speed) and after he was happy, turned and walked back to my cube. Just as I sat back down and looked back over there, I did a double take. He was holding up a Mylar pcb sheet with a piece of blueprint paper. My brain froze, I thought maybe he was using the flip side to read it better (the light table was constantly in use by the Tech Pubs folks). But then 43 neurons fired: he was going to make a copy of the pcb layout, by putting the Mylar tape-up into the blueprint machine. I must admit, for about 941ms, my brain sent this message: Watch this! This will be fun! N00b!!! But instead I yelled “STOP!” as loud as I could and started sprinting over there. Blueprint machines are kinda noisy: pumps, rollers, fans, etc. I got about 80% of the way when he realized what was going on: The UV light plus the ammonia vapor in the machine/air (it wasn’t even in the ammonia chamber yet) made the tape unstick from the Mylar (the Puppets held). Then, the rollers, like my Dyson vacuuming up the cat hair, stripped off the tape and wrapped it good and tight around themselves. The Mylar made it most of the way through, but the torque vector was perpendicular to the roller torsion, causing what is called in the business “a crumpled event”. By this time I got there, hit the Reverse switch to see if the roller debris would un-spool itself. No luck. At this point, the machine jammed and the power supply inside blew up to protect the AC line fuse. Repair cost? About $1,200 (in 1981) and a $6,800 layout destroyed. Moral: never assume anything! The blueprint machine was designed for a *specific task*, it was NOT a Xerox machine! Epilogue: Crow here again. I decided to look into what happened to Bishop Graphics. It is not pretty. Their core business was quickly eroded between 1985 and 1987 by the emergence of CAD applications. In one of the most short-sighted statements ever Bishop nailed their own coffin shut with this: “Bishop’s executives, including Salvin, thought computer-aided design, or CAD, was a fad.” Well, that “fad” has permeated nearly every aspect of design today. Cheers! Thanks for the trip down memory lane. You and I are about the same age.